Eventually, Microsoft will bring a touch-optimized version of Office to the iPad. 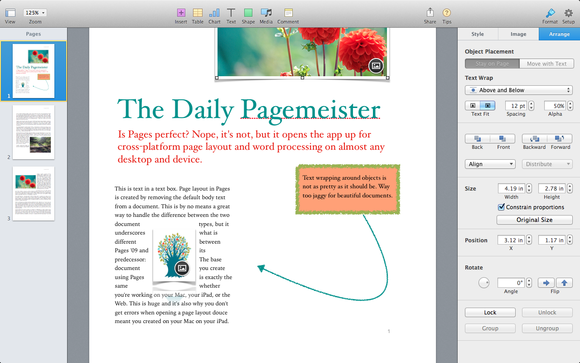 Until that day arrives, however, there’s Apple’s iWork—and now HopTo, which offers a reskinned version of Word as lovely and useful as an iPad app should be. Best of all, it’s free, and the HopTo app is available Thursday in the Apple's App Store. Why try it? Because other virtualized, cloud-based versions of Office have largely failed to gain traction on tablets, hamstrung by the need to route virtually every instruction through a remote server. The virtualized apps are slow and unresponsive, and always threaten to disconnect and crash at the worst possible time. Worse still, users have typically had to pay for their troubling experiences, often via a monthly subscription. The alternative has been to use native iPad apps. Apple’s iWork suite is probably the preferred choice, but there’s also ByteSquared’s Office2HD and DataViz Documents to Go Premium. But various quirks—such as Apple Page's burial of the “Save As” command, for example—have left some users pining for something that makes more sense. Hopto can access files from a variety of cloud services. HopTo, however, appears to have changed the game. Chief executive Eldad Eilam gave me a demo of a final version of the HopTo app a short time ago, before it entered Apple’s app approval process. It doesn’t provide a total replacement for Apple’s iWork suite—for example, you can create and edit Word and Excel files, but only view PowerPoint documents at present. But it also adds file management (a capability iWork lacks), as well as the ability to work with multiple cloud providers. And it uses a licensed version of Office 2010 as its base, providing “per-pixel” compatibility with Office. Unfortunately for HopTo, Apple recently made the iWork suite free for users who purchase a new iOS device, making iWork a much better bet than if HopTo had debuted a few months ago. 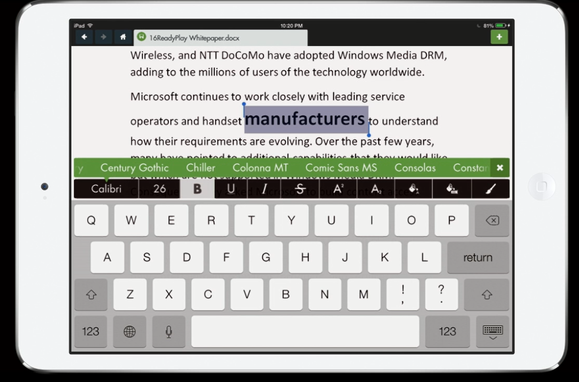 And, of course, Microsoft is expected to release touch-enabled versions of the Office suite for iPads and Android tablets sometime next year. But HopTo’s elegant UI and giveaway price tag makes the app a strong candidate as your iPad productivity application of choice. It just does more, for less. 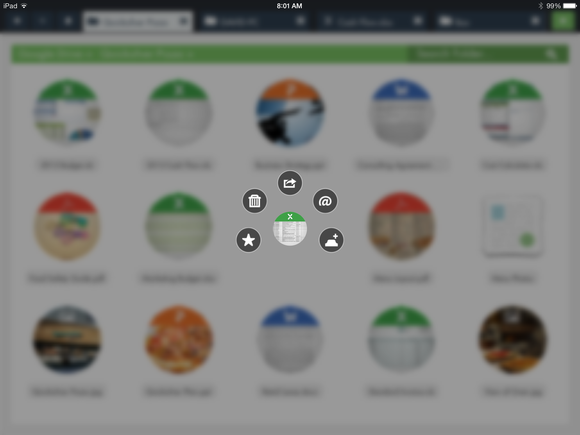 Documents can be quickly shared with a long press, which brings up a radial menu. After downloading the app, you're presented with a bold, attractive home screen, with three sliding rows of icons: recent documents on top, My Documents in the middle, and a list of cloud providers at the bottom. Instead of just storing documents on iCloud, you can save and load documents from Google Drive, Box or Dropbox, or directiories within your own (connected) PC. Like Windows 8, you access various options by sliding left and right through various choices. Each document’s title also includes a badge denoting which cloud service is hosting the file. 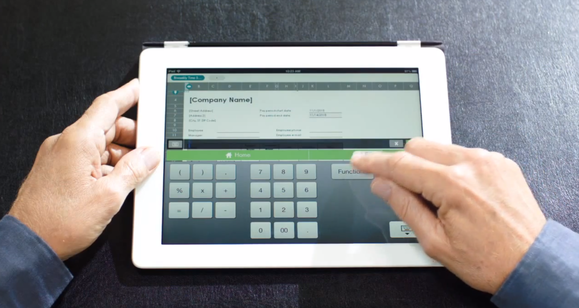 To access various menu options within HopTo, you simply slide various option bars left and right. In fact, the only services that HopTo doesn’t connect to are owned by Apple: It can’t search your Mac, and HopTo can’t currently connect to iCloud, either. While this will be a showstopper for some, Eilam said this shortcoming would be resolved in the future. Eilam says that Office files opened within HopTo will provide “pixel perfect,” 100 percent compatibility with Office. That appears to be the case. Since HopTo is based on Office 2010, XML-based file formats like .DOCX should display just fine. HopTo’s file manager provides a snapshot of the file itself. All you need to do to begin editng a document is to double tap on the screen. Highlighting a word allows you to change the font’s size and style—note that HopTo uses Office fonts, and not the native fonts from the iPad. One of the only hitches we noticed was that Office graphically displays what the font looks like, while HopTo simply lists them (at least in the version that Eilam demonstrated). HopTo also has a couple of nifty tricks up its sleeve. To add images to a document, you can add a photo from the iPad’s camera roll. But HopTo also allows an option to search online using Google’s image search, pulling up thumbnail images from who knows where—quite literally, as they’re unattributed. But as those images can be easily dropped into a document and quickly resized, it’s a useful tradeoff. And HopTo also solves one of the iPad’s little irritations. Normally, the iPad only allows you to do one thing at a time: one document, in this case. HopTo solves the problem by placing each document in its own, separate, browser-like tab, allowing you to quickly switch back and forth. The ability to track changes, a necessity for collaborative document creation, is also included. In general, Hopto offers everything Office 2010 does, save a few esoteric tools and options, Eilam promised. HopTo’s spreadsheet app provides specialized keyboards. HopTo provides an optimized interface for its version of Excel, as well. Keyboards are context-aware: For cells that HopTo knows contain numbers, Hopto doesn’t even display an alphabetical keyboard. Slider bars allow you to alter currencies, convert to various decimal formats, and make other tweaks. However, it’s not clear whether Hopto retains the same numerical limitations as Excel 2010 — 1,048,576 rows by 16,384 columns, for example—or offers a smaller subset, due to the iPad’s memory constraints. Unfortunately, PowerPoint compatibility remains a weakness. Although PowerPoint files can be viewed, even with transitions, document creation and editing is unavailable (though will be added in the near future, Eilam promised). But a few bonuses try to make up for it. Although the iPad was designed to eliminate file managers, Hopto builds one in for people who just can’t stand not knowing where their files reside. There’s also a built-in photo viewer. Apple’s iWork suite: Pages, Numbers, and Keynote are all $10 apiece, although they’re free with the purchase of a new iPad. In general, Macworld has raved about Apple’s latest update to its productivity suite, with some criticism reserved for the latest iteration of Numbers. 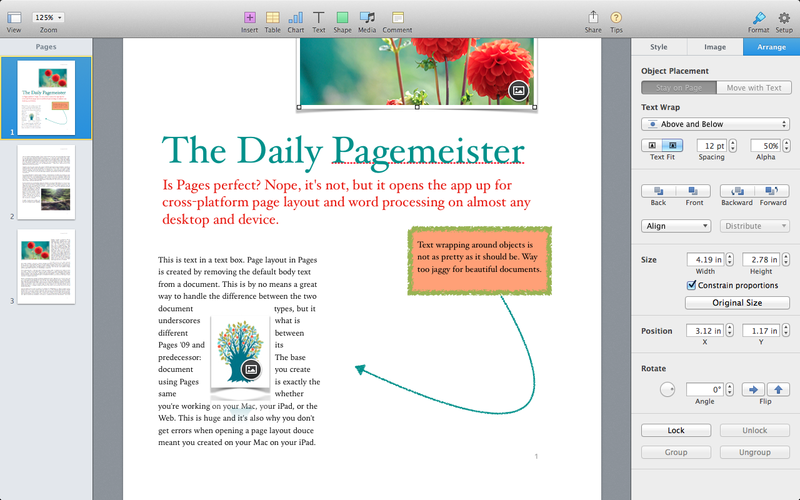 On the iPad, Apple's Pages app is the incumbent. ByteSquared’s Office2 and Office2HD: Although ByteSquared charges $6 for the iPhone’s Office2 app and $8 for the Office2HD app, the Macworld Office2/Office2HD review knocked both for a lack of Office compatibility and formatting limitations. DataViz Documents to Go Premium: The $16 Documents to Go Premium app is functionally sound, although with baffling design choices, such as the labrynthine process to simply italicize a word. The presentation app is subpar, however. 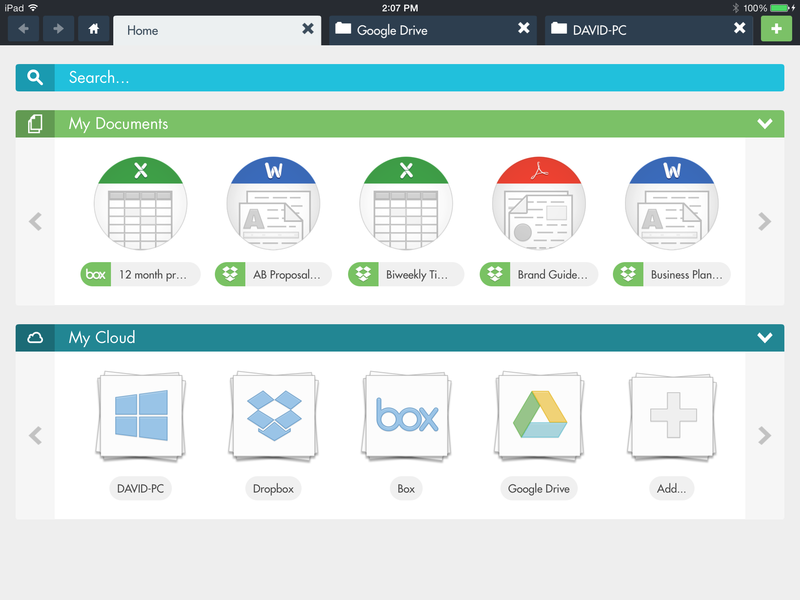 Google’s QuickOffice: Now free, QuickOffice is a snappy app that connects to a variety of cloud services. But the knock on QuickOffice is that you only have limited configuration options to choose from. Basically, it’s basic. AstralPad: Although the app is free, users have complained that it’s not much use. Don’t think of AstralPad as a document creation tool, but as an option to make a last-minute change to a file. CloudOn Pro: CloudOn recently transitioned from an app to the browser. Although the CloudOn app is free, advanced features such as the ability to track changes or pivot tables requires users to purchase a $2.99 per month/$29.99 per year subscription to CloudOn Pro. Microsoft’s Office Web Apps: Although Microsoft’s free OWA services will run within the Safari browser, they’re not really effective enough for daily use. Frankly, there are simply better alternatives, many of them for free. 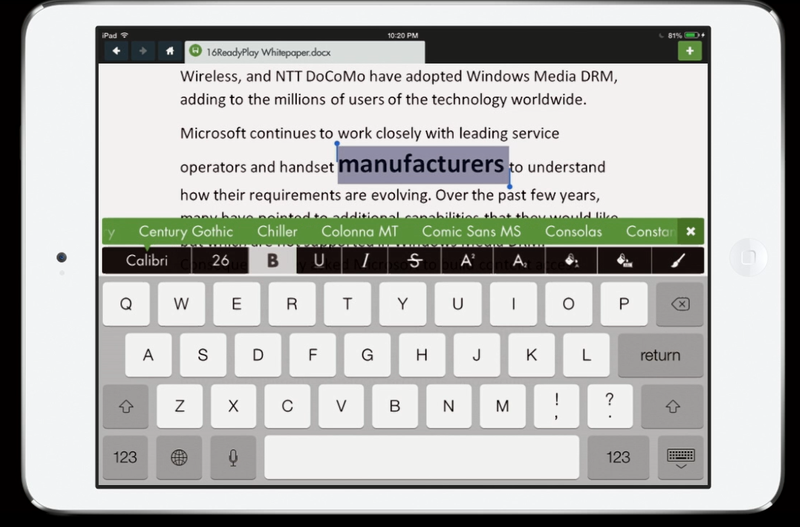 Eventually, Microsoft will release a touch-optimized version of Microsoft Office for the iPad. But that won’t happen until the company develops a touch-optimized version of Office for its Surface tablets—which, as Microsoft demonstrated in July, it’s working on. Only after that will Microsoft push Office to other platforms, like the iPad. HopTo clearly knows that the axe is falling, but Eilam sees a way to dodge the blow. If Microsoft continues to require customers to subscribe to Office 365, then any version of Office for the iPad won’t really be free. And Microsoft will probably make the same choice that Apple has made with iWork: restrict its files to its own cloud service—in this case, SkyDrive.